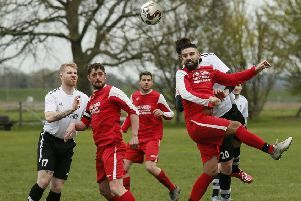 Ampthill Town enjoyed a second consecutive midweek away win on Tuesday at Langford, with a 3-0 success, but they lost at home on Saturday for a fourth time when Brimsdown beat them 2-1. Ampthill began confidently at Langford, and Arrun Ramsay put them ahead when he converted a cross from Dan Butler. Town went on to have the better of the game, with Dan Butler and Carl Ramsey both working hard up front and Mike Draycott putting in another good shift in midfield. Butler saw a shot well saved while brother Ben hit the post from a corner and Langford hit the bar. The game was decided by two Town goals inside five minutes around the hour mark. First a Draycott free-kick found the net from the head of a defender and then Ramsay rounded the keeper to slot home for 3-0 after good work by Dan Butler. Langford found Jack Ambler in good form as they tried to pull a goal back but Ampthill might have increased their lead, with openings from Ross Airson and Connor Saunders going astray when well placed. It was a valuable three points from a hard working team effort which showed plenty of character after the home defeat at the weekend. Town had plenty of possession in the first half against Brimsdown but the visitors went in ahead at the interval with a 20-yard shot which went through Jarman-Webb’s defence. Brimsdown doubled their lead in the second half when the scorer was left unmarked from close in and, although Connor Saunders swung in a consolation goal, Town took nothing from a game where they lacked firepower in the last third of the pitch. Town have no game this weekend and go to Brimsdown on Wednesday in the SSML Division One cup before their home FA Vase tie with London Tigers on Saturday week.